A corner, an entrance, a table setting, what ever it may be just a hint of inspiration,changes the look of our homes interior, and with the changing mood we move on through the year (and isn’t it passing quickly). 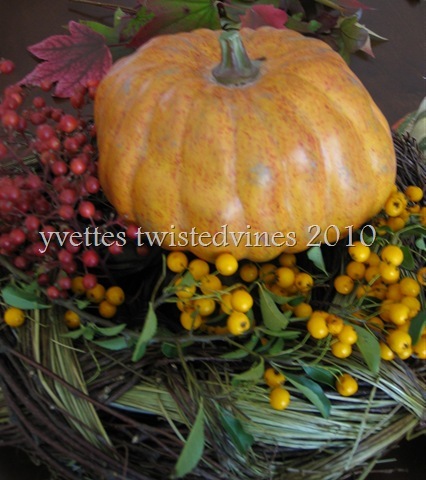 Autumn is a spectacular season,with it’s changing colours of reds,yellows and oranges,I’ve only put a hint of it in my home.With this hallway display of coloured berries from the garden and a pumpkin sitting in a birds nest garland. However as it’s nearly Halloween,and the end of another month, I wanted to add a little spook to the display. Halloween isn’t really celebrated here in Italy, although we have been invited to a Halloween dinner with my American girlfriend this year. 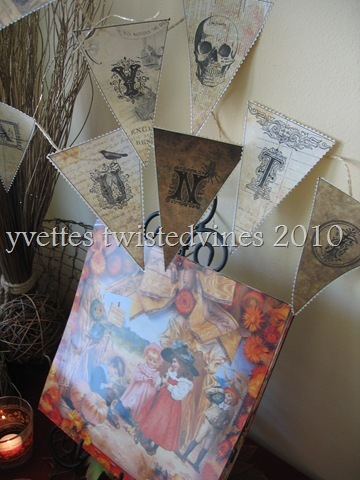 If you’re looking for a little spook why not grab this idea, Happy Haunting Bunting by Moselle. I printed out the motifs free, printed them on to Ivory parchment paper, drew a black pen border around each letter them glued them to kitchen twine,and as you can see a real treat to the eye. 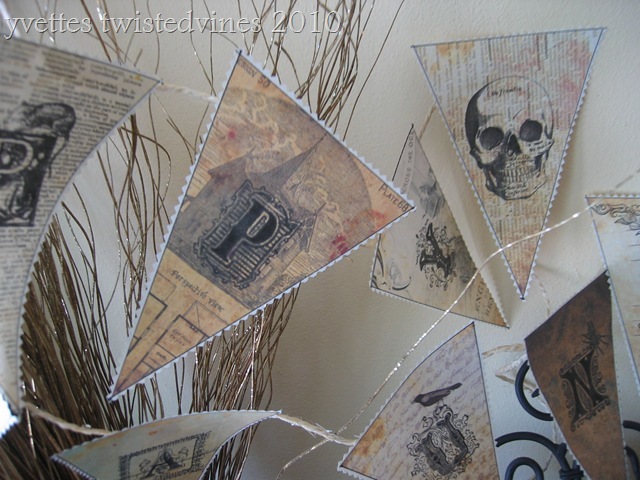 A touch of vintage don’t you think, and very cost efficient and we all like that! I like the more soft effect of a wave more than a rigid straight banner, but of course it’s up to your creativity and design. Just have fun! Click on the above link to download your Halloween motif free…they also have trick or treat tags, have a look around and have some fun for Halloween. just take a look at her Free Printable Cupcake Wrappers, just a bit of jazzing up for those Halloween cupcakes…You’ll love them! 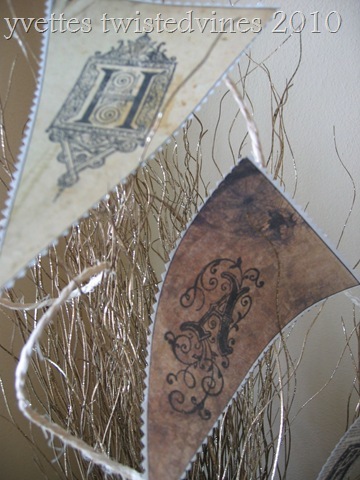 Carol has some wonderful ideas and stunning frugal projects so take a look at her blog. 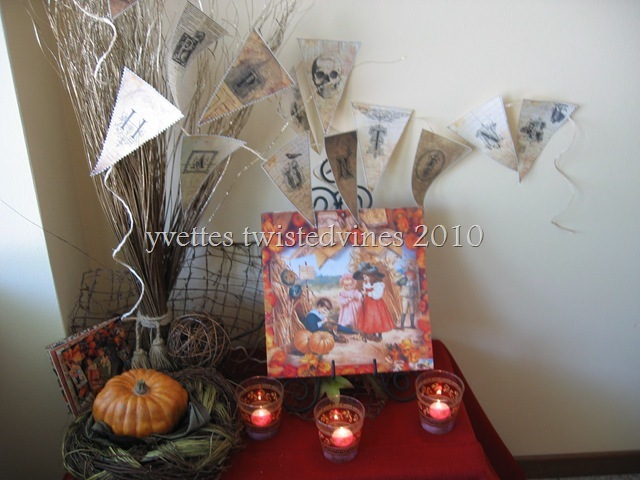 So have some fun putting some Autumn colours in your home and adding a little bit of spook in the corners! 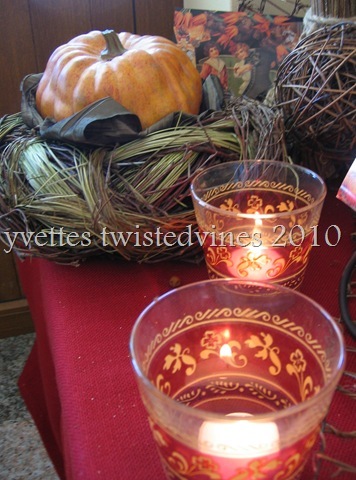 Do you celebrate Halloween and have you a little spook in your home? What are you doing around your home at the moment? In South Africa we don’t do much home decorating for Halloween, it’s very hot, so all activities happen outdoors. Our local park has a fun themed evening and all the families get together there and picnic on the night. I will do a post about it the day after. I’ll wait for your photo’s…Italy’s quiet also, the school year has only just started here, a few shops do decorations and even a few sweet surprises in bakeries otherwise nothing too fancy! 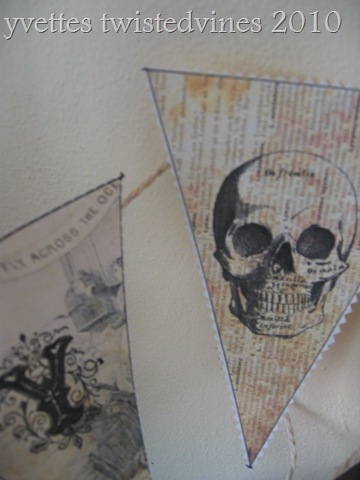 I love those banners with their triangular flags and their antique look. I particularly like the one with the bat on it. 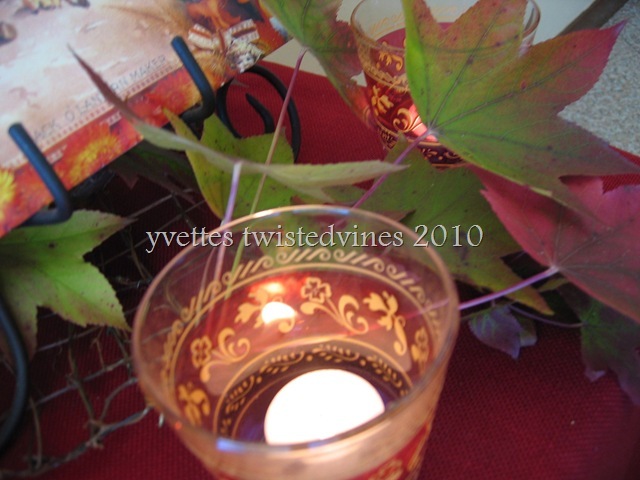 I’ve never thought of decorating my home for Halloween, and I don’t remember it being a big deal when I was a child as we have Bonfire Night or Guy Fawkes on 5th November, which is the big autumn party here, with fireworks and festive outdoor food. But I do have a pumpkin – don’t know what to do with it – and each year children come to the door for sweets, and my little dogs bark their heads off when they see green masked monsters at the door in the dark, sometimes I don’t know who is more scared. Your display looks great! 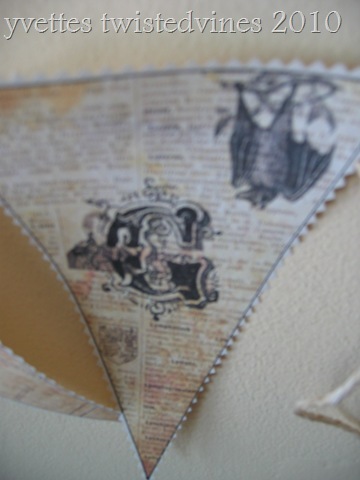 I love the vintage look of the bunting. Hallowe’en is a huge holiday here, with stores beginning to sell Hallowe’en decorations at the beginning of September, and children often start planning out their costumes as soon as school starts again. I do not decorate my home for Hallowe’en, but will defintiely need a “touch of spook” in my classroom for our annual Hallowe’en party day. I’ll definitely be checking out the blog you mentioned for some ideas. As always you are full of great and different ideas…thanks for sharing!